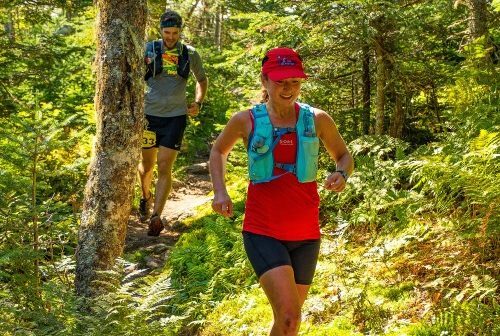 On September 8, 2018 Rockhopper Races hosted the Kilkenny Ridge Race 25 mile and 50 mile races. This was the first time that a trail race held in the White Mountains of New Hampshire went over summits of the 4,000 foot mountains! 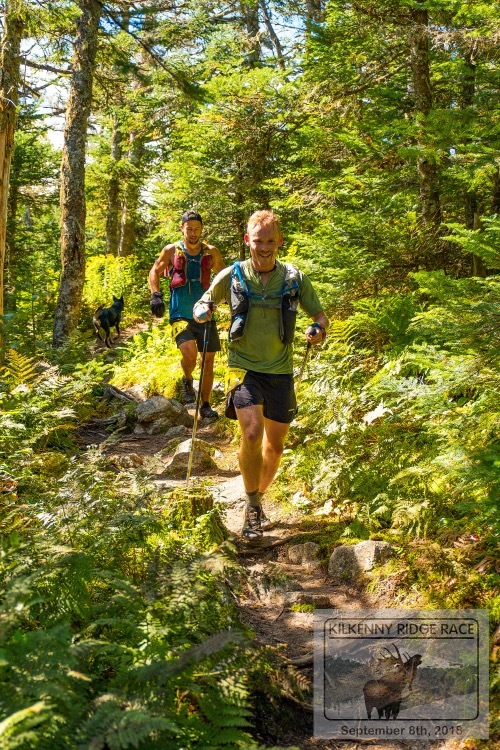 The 50-mile course traversed from South Pond in Stark, NH to the Waumbek Golf Club in Jefferson, NH and back to Stark on the Kilkenny Ridge Trail which includes two of New Hampshire’s 4,000 foot mountains: Mount Waumbek and Mount Cabot. The 25-mile course started in Jefferson at the Waumbek Golf Club and finished in Stark, NH at South Pond. 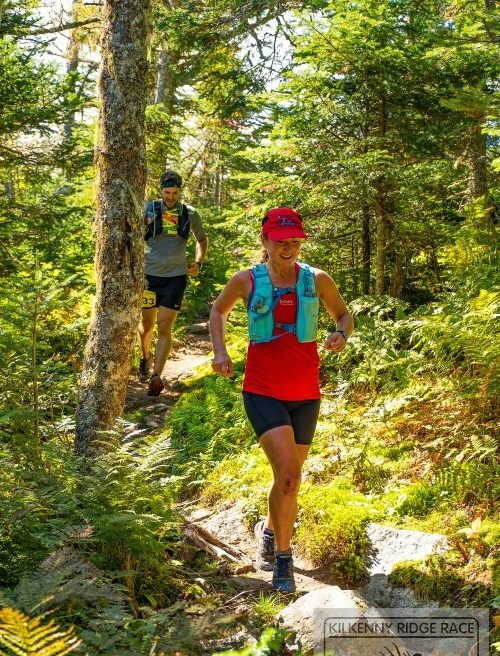 The Kilkenny Ridge is a rugged and beautiful ridge with forests that change from thick pine to mossy enchanted forests to rugged boulder hopping up and over the summits of two peaks in the NH 48 4k list! The run also covers the Weeks, Terraces and had BIB punches on the Terrace Spur and the Horn which offered amazing views! Leading up to the race the temperatures were in the 90’s with humidity so thick it felt like you were in a steamy sauna. Race day came and the weather broke with highs in the low 60’s and temperatures hovering around the low 30s overnight. It was perfect weather for running! With a slight breeze and sunny skies the runners were treated to some of the best conditions New Hampshire had all summer! Getting aid on the course was a challenge as food and supplies would need to be hauled in three miles uphill for two remote aid stations. Volunteers camped on the ridge and used hanging water filters to filter over 50 gallons of water from streams and a pond for thirsty runners. The volunteers did an amazing job of keeping up with the thirsty runners and having fresh filtered water for everyone! They also had a variety of food for the runners and one aid station even had volunteers in costumes to bring smiles to the runners who would be out in the dark. There was one angry hiker who removed almost two miles of course markings but each runner was given a map of the course to follow in case this happened. Luckily everyone was able to return to the finish line safely. The finish line offered plenty of food, warm blankets, socializing and a lake to swim in after a long day of running. There were some very fast times on the course with Aaron Stredny taking the men’s win in the 25-mile race in a time of 5:14:06 and Hillary McCloy taking the women’s win in a time of 5:47:16. In the 50-mile race, Rob Rives won in 12:33:50 and Lisa Rising took the women’s win in 14:03:51. Complete results can be found on UltraSignup. Race Sponsors were La Sportiva, Julbo USA, and Tailwin. The race was held in conjunction with the US Forest Service and utilized the Cohos trail.